The back-lit church Our Lady of Loretu in Ghajnsielem with the sun shining through a window in the tower below a blue sky. Ghajnsielem is in the east of Gozo. 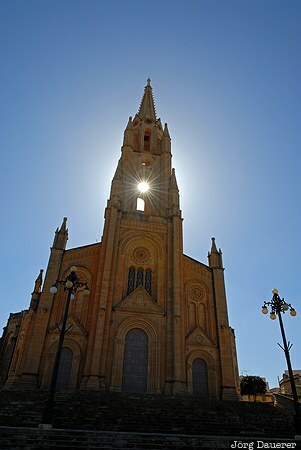 Gozo is an island in the Mediterranean sea that belongs to Malta. This photo was taken in the afternoon of a sunny day in March of 2009. This photo was taken with a digital camera.